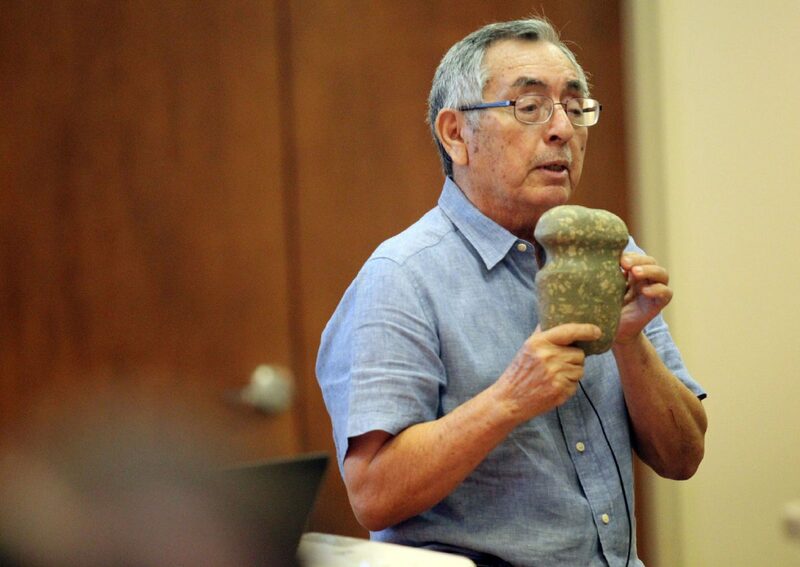 Jesus "Chuy" Correa shows an ancient rock or digging tool used by inhabitants who used to roam the Northern Mexico and Texas border to the crowd that gathered at the Museum of South Texas History on Sunday, July 8, 2018 in Edinburg. EDINBURG — Starr County stories — the real stories — are not ones you’ll always find in a textbook. That was one of the topics that Jesus “Chuy” Correa, a Ciudad Miguel Alemán, Tamaulipas native spoke on during the monthly speaker series at the Museum of South Texas History. He gave a short dialect on general history, from when Native Americans ruled the new world to the ventures of Christopher Columbus in 1492, when he landed in North America, and explored what is now the United States and Mexico. He slowly made his way to the earliest of days of Starr County, explaining how Roma and Rio Grande City were named. Rio Grande City had two names prior to its current one, which came about in 1848 by Blas María de la Garza Falcón, a Spanish captain and settler of Tamaulipas in 1752. Some people dispute this history. Previously it was known as “Ranchito De La Lomitas” before being renamed to Rancho De Los Garzas. The Tamaulipas native also spoke about Henry Clay Davis, born in Georgia on Sept. 29, 1814 and was a soldier, merchant, landowner, and ultimately, became a founder of Starr County. He also said a descendant of Davis was in attendance. Correa also discussed the history of Roma-Los Saenz, Texas and the Battle of Fort Ringgold with illustrations of the buildings in the area then and now. Correa said he loves learning about where he comes from and the history of towns. As part of his presentation, Correa had a table of artifacts laid out such as wood-carving tools, stones, reference books, and a mock-up steamboat called “Bessie” that he built. The original was used for navigational purposes along the Rio Grande during the late 1800s and early 1900s. He also encouraged anyone to visit Starr County, learn the history and visit the older buildings that remain. If you would like more information on Jesus “Chuy” Correa’s novel, “The Real Stories of Starr County, Rio Grande, Roma, Escobares, La Grulla, and Vicinity 1582 – 1900,” the book may be purchased at the museum’s store. Correa has also had works in previously published novels, “History of Ciudad Miguel Aleman, Tamaulipas” released in 2002, “A History of Christopher Columbus” released in 2005 and “The History of Roma, Texas” released in 2009.